Why is the proper care and maintenance important? Since their invention, area rugs have been designed to last for generations. 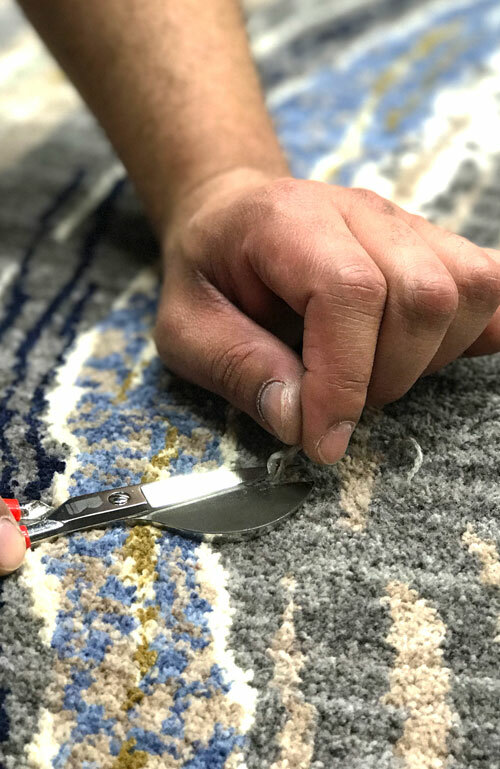 Whether you own a hand-tufted rug made of New Zealand wool or a machine made synthetic fiber , the key to keeping them looking great is the proper care and maintenance of your rug. An area rug's first line of defense against premature wearing is a good rug pad. The main function of a pad is to absorb the pressure applied to the rug when walking, to stop it from moving around and to protect your floors. Working like a buffer between the rug and the floor, the correct pad will protect the rug from stretching, help muffle and absorb sound, and add comfort to the rug. The cost of a good padding is often relatively low compared to the cost of the rug and is worth every penny to keep your investment looking great. For all of our oriental and area rugs we recommend our sure-grip pad; which is a felted fiber pad with a 100% natural rubber backing. This particular pad is designed to give your new rug the proper amount of support while keeping the rug from moving around. • Proper vacuuming is the easiest way to keep your rug looking like new for longer. This removes the loose soil and dirt before it can work its way into the fiber and wearing the rug prematurely. • Vacuum regularly, at least once a week, especially during the first month. • Vacuum the rug in the direction of the pile (think of the way you would pet a cat). • Canister vacuums without beater bars are recommended for cleaning rugs. • Hand-held rug-cleaning attachments should be used where possible. • Remove the rotating beater bar for heavily textured rugs like looped or braided rugs as it can pull fibers loose. • If the beater bar must be used then it should be set to the highest setting possible and care should be taken not to damage the fibers. • Powerful vacuums are not recommended because they can pull fibers from the base of the rug. 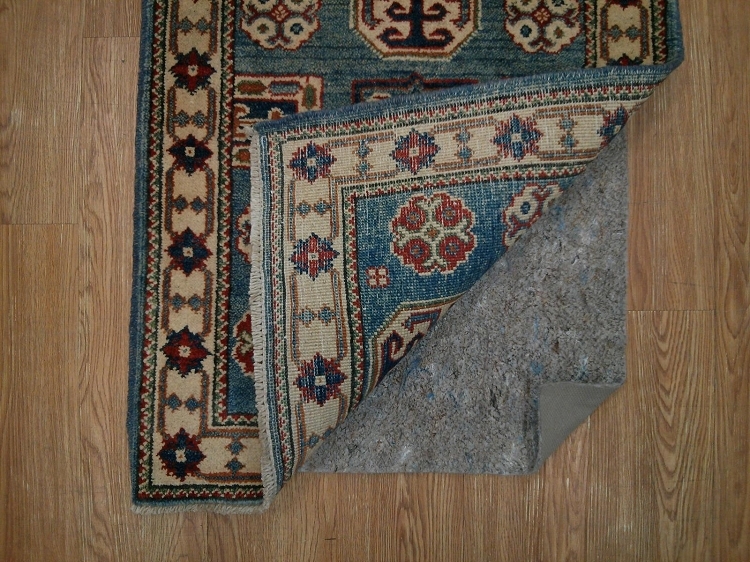 • Reversible rugs should be vacuumed on both sides to prevent buildup of dirt on one side. • Avoid running vacuums over edges and fringes repeatedly as this can damage them. • Certain rugs like leather and shags cannot be vacuumed. Take these outside to be shaken loose. • Regular and proper maintenance strongly influences the durability and long-term appearance of a rug. • Once every few months, flip your rug over and vacuum the back. This removes the settled-in dirt to help the rug breathe better. • Rotate the rug semi-annually. This will help fight wear from high traffic areas and keep the rug looking even all the way around. • Steam cleaning is not recommended as the backing of the rug can shrink and cause the rug to buckle. Although the proper cleaning method depends on the fiber of the rug, there are some common rules to follow in order to keep your rug looking great. • Clean spills immediately. The longer a stain sits on the rug, the more time it has to penetrate the fiber and becomes more difficult to get out. Be especially mindful of pet stains and other acidic spills as they can "burn" the dyes and discolor the rug permanently. • Use a clean, white cloth to blot stains. • Blot (don't rub) working inwards to prevent stain from spreading. • Follow the manufacturer's cleaning instructions if available. • Spot test new cleaners and products before using on a visible portion of the rug. • Ensure that any cleaning products are throughly rinsed out of the rug after cleaning. • After cleaning, use dry towels to absorb remanining moisture. Use a common cleaning detergent or create one with a teaspoon of neutral detergent and a teaspoon of pure white vinegar combined with a quart of warm water. Absorb as much of the stain as possible before applying the cleaning solution. Polypropylene is one of the most stain resistant fibers as it resists moisture damage very well. Avoid placing a viscose rug in a high traffic area as it does not take moisture and heavy foot traffic well. Professionally clean or use a spot cleaner with very little moisture. Polyesters, like polypropylene, is one of the most stain resistant fibers as it resists moisture damage very well. Small rugs can be machine washed in warm water with a mild detergent. Larger rugs should be treated with a dry cleaning powder. Use a dry cloth to blot the stain, then use water and pure vinegar together to treat the stain. Be sure to wring out the cloth prior to applying the solution, as excessive moisture is not healthy for sisal rugs. 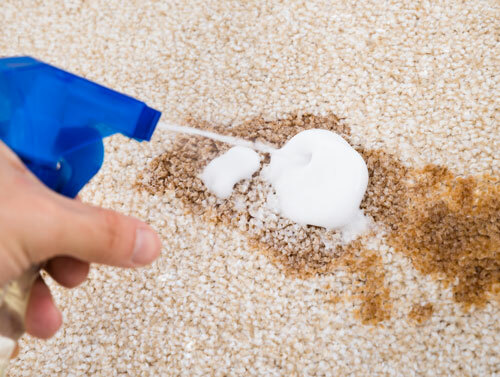 Limit the amount of moisture used when treating a stain and never steam clean. Treat stains by dabbing a small amount of club soda or a cloth dampened with mild soap. Use a common wool cleaning detergent or create one with a teaspoon of neutral detergent and a teaspoon of pure white vinegar combined with a quart of warm water. Colors can vary slightly between rug dye lots and is more common in handmade rugs than in machine-made or power woven rugs. This occurrence can be minimized by ordering multiple rugs at the same time. When a new rug is delivered it may show creases from being folded during shipping. These will disappear after the rug has been laid flat for some time. Rolling the rug with the pile facing outwards and leaving it like that overnight will speed up the process; vacuuming can help too. As the rugs are shipped in a sealed bag, odors from the dyes and fibers can accumulate over time. This odor will naturally dissipate over time when the rug is removed from the bag. Rugs are subject to wear and tear over time and can become faded if exposed to direct sunlight. They should be rotated every six months or so to minimize this. New rugs often shed loose fibers as a natural part of the wearing-in process. This will stop with time and vacuuming can help speed this process along. Some rugs are prone to shed more than other as it depends on the construction of the rug and the quality of the materials its made from. Some loose, long fibers known as "sprouts" may appear above the surface of the rug. These should never be pulled and should only be trimmed carefully with sharp scissors even with the pile of the rug. This is a common characteristic of an area rug and is not considered defective or damaged.